Publications THE ALIGNMENTS SYSTEM 23.01.2012. UNDERWATER ANTLANTIS? In early 2009 the world had spread sensation - the legendary Atlantis is found, about which Plato wrote. From the words of this ancient scholar, we learned that this rich country located on the island was sunk after an earthquake and floods around 9700 BC - about 12 000 years ago. Using the software Google Ocean, which uses combination of satellite imagery and the most recent data of Marine Research, naval engineer Bernie Bamford found at the bottom of the Atlantic Ocean right rectangle which covers an area roughly equal to the Moscow region. He noted that the topography of the ocean at this place remines very much the scheme of modern cities, "as if it was created a human hand." A net of intersecting lines resembling the configurations of the streets, is located in 1000 km from the coast of northwest Africa near the Canary Islands. Experts in the field of Atlantis research confirmed that the object is located in one of the most probable place of legendary island. - This is a very interesting observation, - says Alexander Voronin President of Russian Society of Atlantis problems research - Using these technologies, aerial and satellite photos were found underwater man-made objects near Bahamas, near the western coast of Cuba and elsewhere. 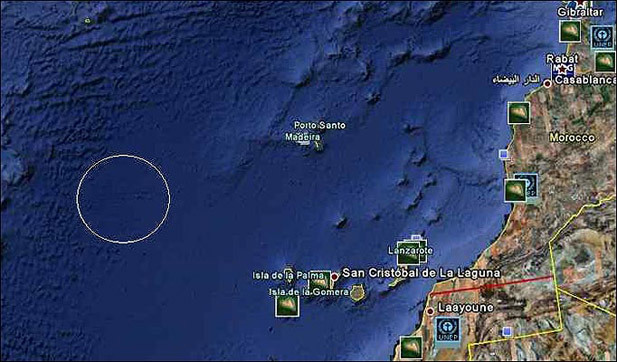 The underwater object is located just in North Atlantic - so the observed area may be quite connected with the ancient mysterious civilization, - says Vladimir Voronin. According to the curator of historical archeology at New York University, Dr. Charles Orser, finding deserves the most fixed attention, despite of the fact that it may be purely geological formation. 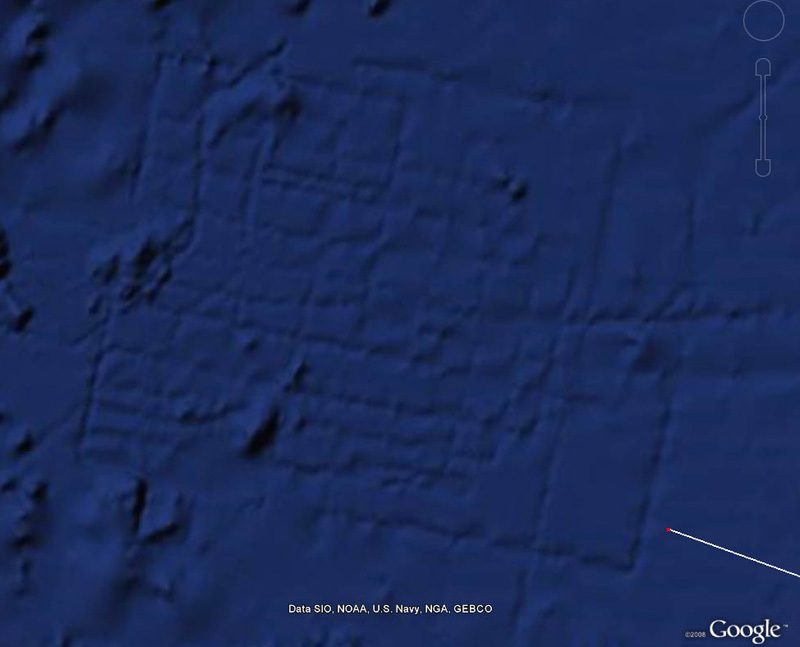 Google officials immediately lowered everybody on the land having declared that the these lines formed on the ocean floor had appeared because of the sonar which descended from research vessels. "What we see are simply false images formed as a result of information collection... Bathymetric data or those on the seabed, often collect with special vessel with sonar ... Along the way of these boats movement just such lines are produced in the form of reflection. 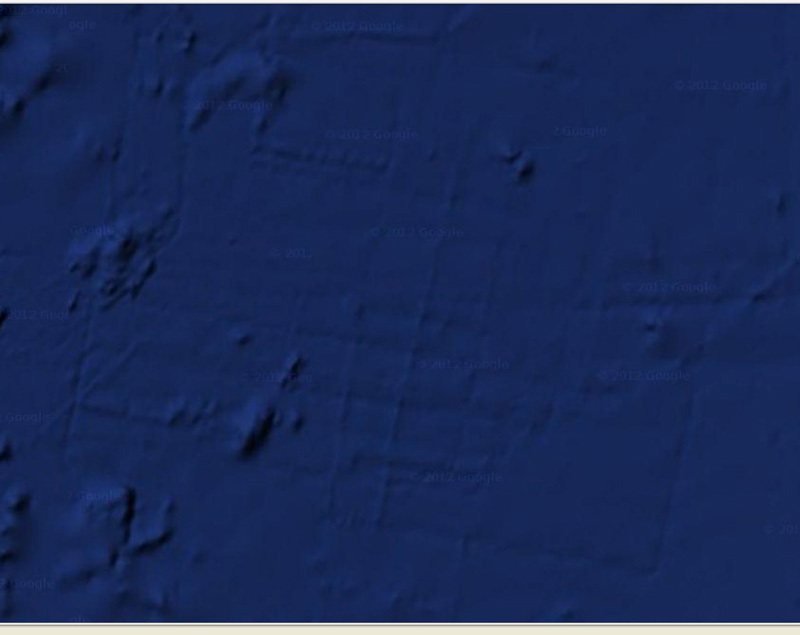 Between these lines there are obscure spaces, but it only shows that we still know few about the oceans "- was told by Google. But not everything is so simple. Almost three years have passed and passions about the identity of the object do not cease. If these are errors of location at standing patrol the question arises with what purpose this place in the open ocean is so closely examined? Why is the huge area of the water, about 21 thousand square kilometers, so suddenly carefully studied and with civilian vessel? Sobolle- one of the forum LAH participants having decided to test the hypothesis about that the underwater object "Antlantida" is the remain of large ancient construction carried out retrographic analysis of satellite images. Here's what turn out of it. Satellite photo image is taken as base collapsible provided by the users of Google Earth. It is logical to assume that the object is either technical artifact made with recording means or grooves of correct form of gigantic size, about what, in particular, say directly treatments light and shadow images. For convenience we orientate the image correctly and begin processing. We get rid of the specifics of the seabed, using not distort filters and remove sharp objects such as "hill", "crack." These objects can be either alien or emerge later as a result of natural movement of tectonic plates. We obtain the following very impressive results. Modern tools of raster materials processing allow the estimate many factors. I got the idea to scan the object for symmetry, though, I certainly understand that symmetrical cities with its narrow streets and relief are rare. But at that moment unexpected surprise. was waiting for me. Extinct town was symmetrical by more than 75%! Some individuals have own face less symmetrical than this order , probably at this moment I had just the same face expression. - says Sobolle. Superposition of turned in mirroring reflection of layer, gives the following result. Next is a trick. To elect, and drawn the details. To remove unnecessary layers and colors. To reflect in the perspective. The width of the artifact is 120 km. The width of one the channel is 700-800 meters.The depth is 500 meters. The probability of accuracy of graphical reconstruction is 65-70% (high probability). Further, it becomes even more interesting. Quite recently, Google Earth has updated the image of the object, which were provided NASA and dated 2012. Data are presented as satellite images and after declaration of unnamed employee Google. Image of "Atlantis" has changed, the picture became more faded , but the lines still remained. This can only mean that the vessels were carrying sounders by the same path and they repeated the same clutters. How to relate to the fact of such an unusual artifact existence is a private matter. But at least this is a very interesting object, which probably is not radar error and which perhaps will present us much more surprises. Книга А. М. Кондратова "Атлантиды ищите на шельфе"